1) Cut out two pieces of fleece. One big enough to fit all the way around your child, with some flow-y room. And another piece that is about half the width, and 1 1/2 times the length of your first piece. Mine were about 36x17", and 56x7", which makes about a 2T size. 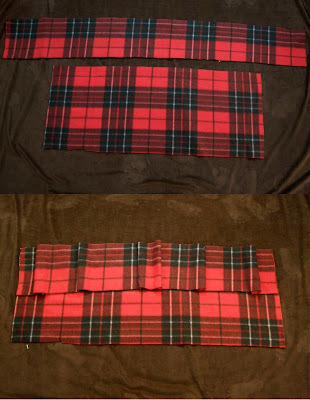 2) Then lay your longer piece on top of the first piece, and make pleats until they are the same length. 3) At the top, cut slits every couple of inches that are about half the width of your ribbon, through all the layers, then weave your ribbon in and out of each hole. 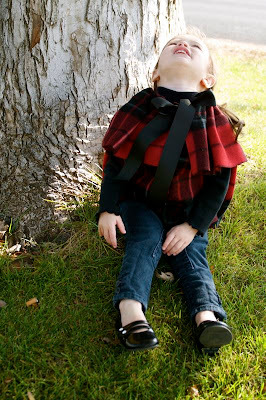 4) Try the cape on your little one, and cut large slits at about elbow height for armholes. 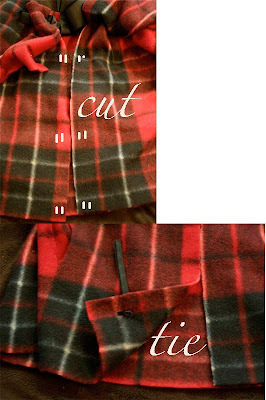 5) Cut two tiny holes right next to each other for your ties. Do this for as many ties as you'd like, on both sides. 6) Cut a 7-8" length of ribbon for each set of holes. Thread them through each set of holes and tie, with knot facing inward. And you're all done! Pretty easy! Hope you're having a good day today! I have to tell you, your blog has easily become one of my favorites! You are so inspiring! great capelet and soooo easy! Ahhh!! Your daughter is so cute in all your brilliant creations! Great project! Adorable! I'm going to make one for ME! Oh my gosh, totally adorable!!! This is AWESOME! Thanks so much for sharing...I just might have to try this at home! That is very cool! I love its simplicity and fanciness all at the same time! That's really cute. Of course, the model totally sells the look! I'm new to your blog but love this idea. Dont have any kids yet but when I do I can't wait to try it!! I can't tell you how much I appreciate all the tutorials, they make me real happy. I have something I made tonight and I thought of you as I was making it. I'll post it in the next day or two. LOVE THIS!!!! Going to look for some fleece remnants tomorrow! THANKS! wow you're so creative! love this! YOu have got to be kidding!!! 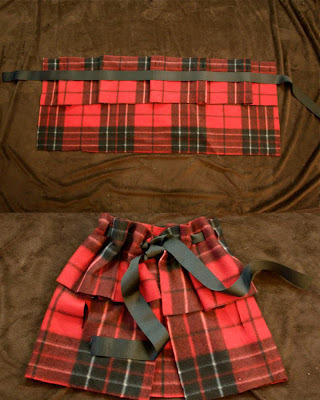 You can make something that cute and sophisticated without sewing! You are the queen!!! I am definitely featuring this one!!! You will get a lot of hits off this baby!!! So cute!!! I love it! 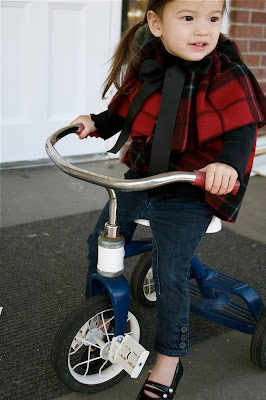 Chic and yet also has great Halloween potential (chic little red riding hood with re-useable cape anyone)? Oh that is so cool! I am going to pass this one on to a friend or two!!! Your little model is just adorable too! I am stopping by from sits! hope your day is wonderful!! A DOR A BLE!!!! I think I might even be able to do that :) I am not crafty at all. I'm going to pass this along. Hello, i referred your creations on my blog. that is the cutest coat ever. Thank you. I will have to make it. Wow! So simple, yet so amazing! I love no sew projects, because I don't have a sewing machine at this point. Thanks for sharing! Wow, You totally impress me!!! Just when you think it can not be any better... Love your blog! I am lovin' it! This blog is kind of like sitting down with a friend and a cup of tea! I love your style! This is SO cute! 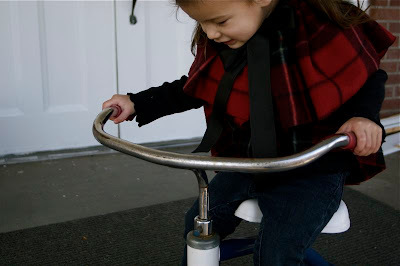 I don't even have a baby girl and I want to make this...So glad I have nieces for this kind of thing...Too fun! This is precious! Thanks for the tutorial. This is absolutely brilliant!! I think I'll make one for my daughter's Halloween costume. She's dressing up as a kitty and we need something in case it turns off cold. Made out of leopard print, I think this will be just the thing. i totally want one for myself! That is adorable! My daughter loves a cape too - I should give it a try. Perfect!! 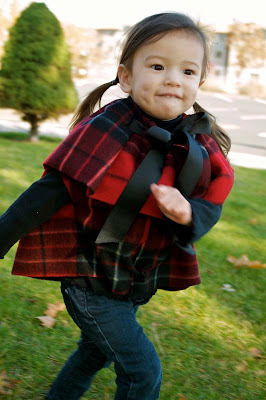 I've been thinking of making my daughter a cape for this winter. (She refuses to wear her coat in the car...and all the on and off with the coat drives me crazy). I'm thinking I could even use a little velcro instead of ties down the front to make it super easy on and off. That will require a tiny bit of sewing, but that's not bad. Oh, I'm so excited, I want to run to the store for some fleece right now. That is so adorable! I love your blog, you have such an eye for make things beautiful. Great job! I am DYING! I will totally have to try this. Bravo! My girls will LOVE these. Thanks for sharing. Your daughter is adorable! Oh my goodness this is adorable!!! Well my goodness, you were thinking. I consider myself pretty creative, but there's no WAY I could've come up with that! You truly are thinking outside the box! Thank you so much for this tutorial. It's very timely, much needed, and it looks simple to make. Thank you again for sharing. This is awesome and your daughter is absolutely beautiful! I can't tell you how timely this post is. My daughter is going to be a black & white fairy (because we can repurpose last year's black & silver ballet tutu), and for extra warmth & cuteness, I found some white striped minky that I thought would be cute as a capelet. Can't wait to give this a try! I love this idea! I can't sew a lick (actually NEVER touched a machine) but my daughter is going to be cinderella for halloween & I'm going to be her fairy godmother. I need a cape for my costume so I think I might try this but... I'll start small & make 1 for her costume first. She'll probably need a little coat over her dress & this way I can make sure it matches perfectly! I am in love with this! 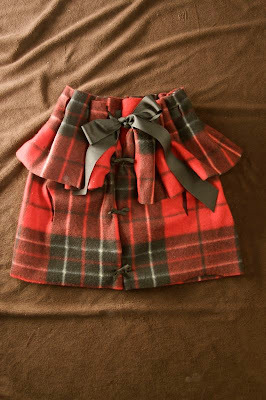 I need to have a baby girl so I can make this! I just don't think I can wait that long. Lucky niece, you get all the good stuff! OH my goodness, my daughter is TOTALLY getting one of these for our Christmas photos! Beautiful and seemingly easy to do. Thanks for the tutorial! Do you mind it I link back to it from my blog? I just wanted you to know I linked this to my post today. I am going to follow you and I hope you will do the same. You just made my night! My DD4 is going to FLIP when I show her we can make these! So very cute! I'm going to have to remember this when life slows down. Wait, it's not going to slow down. Okay, I'm going to remember this the next time I see fleece on sale. I just love this! I'd like to make 1 for myself... but with a hood. Anybody have some ideas on how to make & attach a hood? Maybe I could just use the ribbon that connects the 2 pieces of the cape to add on a hood too? I'm not very crafty but I'm trying my hand at these sorts of things. Thanks! Oh wow, I really love this! I can't believe it's no-sew! I'm going to try this. :-) Thanks so much for sharing! This made the perfect witches cape for my daughters halloween costume! Thanks for sharing. This is STUNNING! You are so insanely talented! I can't wait to try this when my baby is a little older. Hey there! I just finished making this cape and although it turned out in the end, it took quite a bit of fiddling to figure out how exactly you did things. Most of the trouble I had was with figuring out how you folded the top part of the cape (it was hard to see in the picture) and then with how many holes to cut along the length of everything. But now that I figured it out, this cape will be super easy to make in the future! Thanks so much for sharing! I just made this wonderful cape. It looks so comfy on my angel. If I can pass on any advice to anyone...don't buy a contrasting ribbon, buy one that blends in. Other than that it looks great...I made a bow to match with the scraps! oh wow! 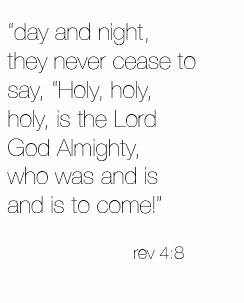 i just love love LOVE this. i want to try it tonight! Daisy I came here from an italian post..and as soon as i finish my first hand made dress for my baby , I will try with your idea!!! fantastic!!! Stumbled acrossed your blog a few days ago, it has me mezmorized, after putting 5 things in my favorite and to do list, I decided it was time to "follow" love your creations!!! 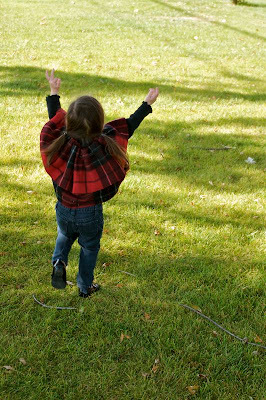 yes you may use the photo of my flutter cape for your "tried it section" I would be honored! HI - I made this and blogged about it on my brand new little craft blog. Thanks for a great tutorial! thank u. u are simply amazing!!!!! Oh gracious! I'm going to make one for myself!!! 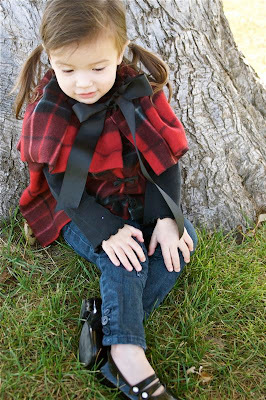 I love this cape and was wanting to make it for my nieces, but your measurements seem so huge to me. Are you sure these are the measurements?? A normal 2T is about 21 inches, so 36 seems just gigantic! If you could help me out with these measurements I would really appreciate it. Thanks. Okay, this is beyond fantastic. I am going to try and make a grown up version to!